In the days when the West was being won, frontier justice often was meted with a rope at the nearest tree, eliminating the complexities of judge and jury. But as the nation matured, so did debate about the morality of capital punishment. By the late 1960s, the country had an unofficial moratorium on the process, which culminated in the 1972 U.S. Supreme Court ruling that said capital punishment laws were, as written at the time, unconstitutional under the Eighth (against cruel and unusual punishment) and Fourteenth (due process) amendments. The tiny town of Holcomb, Kan., proved a case study in the debate about capital punishment after two parole violators in search of money entered a farmhouse and murdered four members of the Herb Clutter family in November 1959. Months later, after a guilty verdict, the decision about the fates of the killers, Richard Hickock and Perry Smith, split the family, town and state. The story of the murder, the eventual capture of the killers and their trial were later immortalized in Truman Capote’s narrative, “In Cold Blood,” in which the author devoted a sizable portion of his book to the death penalty and how justice unfolded. In Holcomb, a place where doors were left unlocked and everyone knew everyone else and their business, few expressed mercy for the men who had committed such a brutal act. Nor did many of Holcomb’s residents feel secure while the two still breathed Kansas air. Even today, many of the characters who remain, when prodded, express satisfaction that the criminals met the justice they deserved. West’s reflects one of many such opinions, but the issue also had more wide-scale ramifications — it prompted statewide debate about the institution of capital punishment, a debate that continues to polarize people nationwide today. 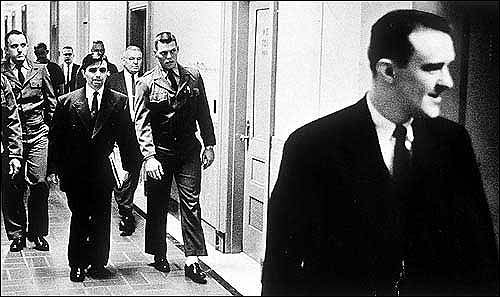 Killers Richard Hickock, foreground, and Perry Smith, in suit, walk through the federal courthouse in Topeka in this 1963 photo taken by Bill Snead of the Journal-World, who was then a photographer for the Topeka Capital-Journal. Since its beginning, the state of Kansas has swung back and forth in its support of the death penalty. In 1859, when Kansas was still a territory, it passed its first death penalty law. The law was done away with in 1907, reinstated in 1935, again repealed in 1972 and finally reinstated in 1994. The method of execution until 1994 was hanging. After that it became lethal injection. Since the law was reinstated, seven men have been sentenced to death in Kansas, but there have been no executions. Their death sentences were thrown in doubt in December 2004, when the Kansas Supreme Court struck down the state’s death penalty statute because of problems with how juries consider evidence during the sentencing phase of a capital murder trial. The Kansas attorney general has appealed the state Supreme Court ruling to the U.S. Supreme Court, which hasn’t announced yet whether it will review the case. When Hickock and Smith went on trial in 1960, life without parole was not yet an option, and, after numerous appeals, the two were hanged in 1965. Before the sentence was carried out, however, the death penalty debate split even those closely affected by the Clutter murders. So did Nancy’s teenage sweetheart, Bob Rupp, who had visited Nancy at the Clutter house the night of the murders and was the last to see the family alive. Others, however, didn’t think ending the culprits’ lives would help them move on with their own. On Nov. 23, 1959, the Telegram printed a letter from Bonnie’s brother, Howard Fox, thanking the town for its support during the family’s funeral but pleading with residents to forgive and move on. At the time, no one knew who had killed the Clutters; the criminals weren’t apprehended for about six weeks. “I have even heard on more than one occasion that the man, when found, should be hanged from the nearest tree,” Fox wrote. “Let us not feel this way. The deed is done, and taking another life cannot change it. Years haven’t changed Fox’s feelings. A member of another family, that of one of the killers, said recently that he had mixed feelings about the death penalty that took his brother’s life. “I don’t believe really an eye for an eye is justice; I really don’t. I never did,” said Walter Hickock, 67, of Jennings, La. “There are things I’ve heard about that have happened in this world that are so bad that maybe some of those people should’ve been executed or whatever. In the case of my brother, I don’t see what that really solved. But then again, I can understand it. Beyond family and friends, the debate about the fates of Hickock and Smith divided the state, community and even jurors. Such a significant issue presented complicated moral dilemmas. Some believed an-eye-for-an-eye justice was the Christian way; others recommended mercy, citing Christianity’s tenets of forgiveness. The dilemma was serious enough that one juror said he thought several potential jurors lied about their position on the death penalty to avoid the trial. Even during the trial, jurors faced the strain of a weighty decision. The office of Kansas Gov. William Avery became a center of public debate through the dozens of letters it received about whether to grant clemency to Hickock and Smith. Some letters begged for “Christian” mercy, but most urged Avery to send the men to the gallows. A group of 11 ministers from Hutchinson, Kan., sent a telegram to the governor in April 1965, just before the executions were carried out, expressing sentiments about Christian forgiveness. But most who wrote the governor wanted the killers to pay the ultimate price and made their opinions known as the execution date was repeatedly postponed during the appeal process. “A commutation to a life sentence would be a foul travesty on justice,” read a letter to Avery from Charles Spencer of Tonganoxie, Kan. Even among self-declared opponents of the death penalty, mercy was rare. Beth Tedrow, a schoolmate of the Clutters’ older daughters — Eveanna Mosier and Beverly English — who had moved away from Holcomb by the time of the murders, is one who perceived capital punishment differently through the scope of a local tragedy. One of few who didn’t have a stomach for executions was Tony Jewell, a former radio reporter for Garden City station KUIL and one of a few select witnesses to the hangings. “I looked up and saw the gallows with two ropes hanging down, and I thought, ‘What an awful thing I’m watching,’ ” he said. For many in western Kansas, the death penalty wasn’t just about avenging the murders of four local people. It became a matter of public safety. Sometimes the closure capital punishment brings can help a community heal, said John Sanders, a Garden City Community College psychology professor. “It doesn’t bring anybody back, but they feel like the situation is under control,” he said. Even James Post, the prison chaplain who counseled Hickock and Smith when they were imprisoned petty criminals and later oversaw their hangings, didn’t object to the punishment. Post is 91 and has Alzheimer’s Disease, so his son, James Post Jr., commented on his father’s career as prison chaplain. West, who had to decide whether to push for life sentences or the death penalty, said anything less than the death penalty left a window open for Hickock and Smith to be freed and perhaps harm others. “It was a crime of such magnitude that I didn’t want the guys ever to get out and murder someone else,” he said. It may be difficult to understand today the alarm Holcomb residents felt 45 years ago. Local youths such as Tedrow were forced to stare mortality in the face — Nancy, 16, and Kenyon, 15, had been active community members, so their murders affected many young people. The scary thing about the murders was that they were absolutely unprovoked, Tedrow said. “It was so random … people wondered, ‘Why’d they pick that family? Why didn’t they pick us? '” she said. Beyond the opinions of people affected by the murders is Capote’s message about the death penalty. Various reviews questioned whether Capote was too sympathetic toward such cold-blooded murderers. The hangings provided closure for the book, but some wonder whether Capote went beyond the tidy ending he needed. Of the four-section narrative, one section, “The Corner,” is almost completely devoted to the criminals’ imprisonment and execution. To write “In Cold Blood,” Capote spent hours with Hickock and Smith, something that affected his views on life and the death penalty. He acknowledged his firm stance in opposition to capital punishment. “I had a great understanding for both (Hickock and Smith), and for Perry I had a tremendous amount of sympathy,” Capote said. In the book, while Hickock goes to the gallows with flippant remarks that make him seem both arrogant and at ease with his fate, Smith timidly apologizes, creating a more sympathetic character. Yet many in the community, and certainly the jury that pronounced final judgment on the killers, believed Smith had exhausted his allotment of second chances.